Kumbakonam is known by various names such as Kudamooku, Thirukudandhai. The legend behind the formation of Kumbakonam is based on the creation of fresh lives at the end of a yugam. 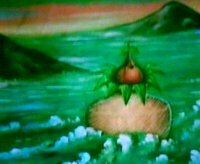 Once, just before the great pralayam that would bring an end to the world, Lord Brahma prayed to Lord Siva to protect the primal matter (srishti bheejam) from destruction so that he could create fresh lives for the new yugam. On Lord Siva's bidding Lord Brahama made a kudam(pot) out of sand & amirtham and placed the primal matter amidst amirtham (amudham) in the pot, safeguarded by the Vedas, puranas, epics. 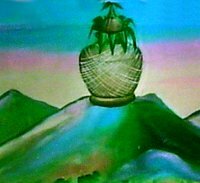 He placed mango leaves and coconut on the mouth of the pot, wrapped the pot with the sacred thread and hung it by darbai in Kailai and performed pooja to this pot. During the pralayam floods this pot was cut loose & started drifting Southward. The pot reached a spot where the darbai & the sacred thread fell off. The pot drifted further north west & finally came to rest. 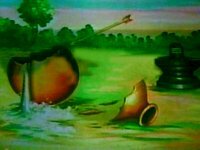 Lord Siva sprung an arrow from his bow & broke the pot open at this spot. The amirtham from the kudam spilled all over. Since the amirtham spilled from the spout (moookku) of the kudam, the place came to be known as Kudamooku. 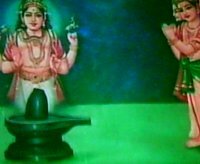 Lord Siva created himself as a Lingam out of the sand & amirtham. This is the Lingam in the Kumbheswarar Koil. Since this Lingam was formed before any lives could be created, the Lord here is Aadhi Kumbheswarar (aadhi - the foremost). 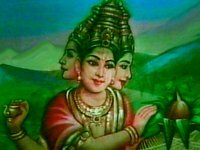 Since he was formed from the amudha kudam, he is also known as Amudha Kumbheswarar or Amuthesar. The spots where the amirtham spilt became the Mahaamaha theertham & Potraamarai kulam.